Payoneer is a payout destination available for Envato Market and Envato Elements authors. You can use it to receive earnings of $50 and over, via Global Bank Transfer, Payoneer Prepaid Mastercard, or USD Swift. Read on for some common questions about using Payoneer. What is a Payoneer Prepaid Mastercard? Registering for a Payoneer Prepaid Mastercard allows you to transfer earnings to your card and check your balance and transaction history online. Once registered, your card will be sent to you in the mail and can be used anywhere a Debit Mastercard is accepted, worldwide or online. The transfer fee to your Prepaid Mastercard is $1.50. What is a Global Bank Transfer? This option allows you to receive your earnings directly to your existing local bank account, in your chosen currency. Payoneer offer payments in over 200 countries and more than 150 currencies. Currency conversions take place from USD and costs $1.50 per transfer, plus 2% FX conversion fee on top of the daily mid-market rate. Global Bank Transfer is a popular payment method due to our competitive FX rates. Below are examples of the fees that would be applicable from USD to a local currency at different transaction amounts. The final transfer amount will be the equivalent in your local currency. Use the table below to compare your current fees with Payoneer fees. ** The final amount will be in your local currency via a localized payment. Available country and currency are provided during the registration process. What is a USD SWIFT Via Payoneer? Payments sent via USD SWIFT transfers to your bank account via Payoneer will incur a flat fee of $15.00. Any FX conversion costs thereafter to local currency will be applied by your bank. Please consider the various costs associated with USD SWIFT once local conversion takes place and compare the best option for you via our fee table above. How do I set up a Payoneer account? To receive earnings via Payoneer, go to the Payouts page of your Envato Market account and select the Payoneer option, then click the Click here to register link. This will take you to the Payoneer website where you can sign up to one of the Payoneer withdrawal options, and will ensure that account is automatically linked to your Envato Market account. You can either order the Payoneer card or sign up for the Global Bank Transfer service. You need to sign up for one or the other – you can’t have the Payoneer card and also receive payments to your bank account. If you need further guidance with the Payoneer registration process, please see this article. Can I add more than one Envato account on my Payoneer card? Yes. 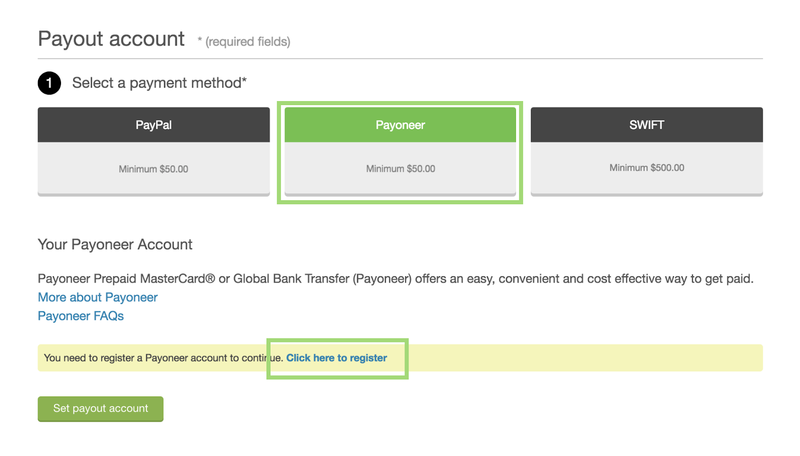 To add an additional Envato Market account to an existing Payoneer Prepaid Mastercard, sign in to your Envato Market account, proceed to your Earnings page and select the Payoneer option. Hit Click here to register and then follow the prompts under the Already have a Payoneer account? heading. I already have a Payoneer Prepaid Mastercard, can I add my Envato account to it? Yes. To add an Envato Market account to an existing Payoneer Prepaid Mastercard, sign in to your Envato Market account, proceed to your Earnings page and select the Payoneer option. For more information, you can visit Payoneer's FAQs page.